I'm surprised at the alarming number of customers purchasing nebulizer systems for their children. So many that nebulizer manufacturers have introduced models designed specifically for children. Penguins, farm animals, race cars, and more disguise these medication delivery systems. Asthma is caused by inflammation in the airways. When an asthma attack occurs, the muscles surrounding the airways become tight and the lining of the air passages swell. This reduces the amount of air that can pass by, and can lead to wheezing sounds. Most people with asthma have wheezing attacks separated by symptom-free periods. Some patients have long-term shortness of breath with episodes of increased shortness of breath. Still, in others, a cough may be the main symptom. Asthma attacks can last minutes to days and can become dangerous if the airflow becomes severely restricted. African-American and Puerto Rican children are six times as likely as white children to die of asthma. Inner-city children are exposed to more indoor and outdoor allergens, triggers for breathing problems, in their home. Children in poor inner-city communities are disproportionately exposed to both indoor and outdoor allergens — cockroaches, mice, mold, dust, cigarette smoke, automobile exhaust, soot — that can trigger breathing problems. Children's airways are narrower than those of adults. This means that triggers that may cause only a slight problem in an adult can create more serious problems in children. 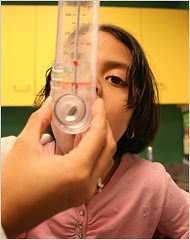 In children, an asthma attack can appear suddenly with severe symptoms. For this reason, it is important that asthma be diagnosed and treated correctly. Some children may need to take medicine every day, even when they do not have symptoms.